Mont Blanc provides a highly-customizable experience. Mont Blanc is a personal, clean and modern theme with an incredible attention to details and performances. Mont Blanc will automatically adapt to the size of the user's device to create a smooth experience on both desktops, tablets and mobiles. 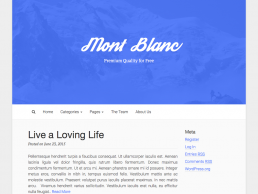 Mont Blanc includes a lot of options which allow you to get the best out of WordPress. Frenchtastic provides brands and individuals with easy-to-maintain WordPress themes. Our themes reflect the brand’s identity and provide a smooth digital experience.